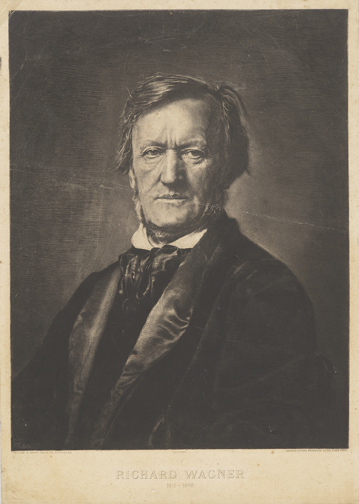 Rogelio de Egusquiza Barrena (1845–1915), Richard Wagner, 1813–1883, 1883. Etching, aquatint, and drypoint after an 1871 photograph by Franz Hanfstaengl, Munich. Gift of Hester Diamond, 2012. The Morgan Library & Museum. 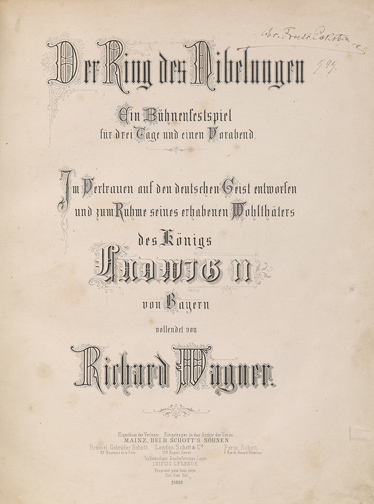 Richard Wagner (1813–1883), Der Ring des Nibelungen [libretto], Zurich: E. Kiesling, 1853. The Dannie and Hettie Heineman Collection, Gift of the Heineman Foundation, 1977. The Morgan Library & Museum. 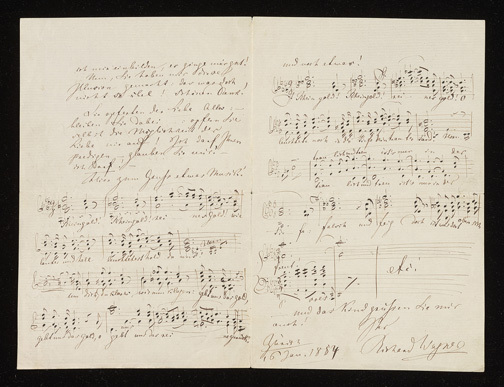 Richard Wagner (1813–1883), Letter to Carolyne Sayn-Wittgenstein including the closing measures of Das Rheingold, signed and dated Zurich, January 16, 1854. Mary Flagler Cary Music Collection, 1968. The Morgan Library & Museum. 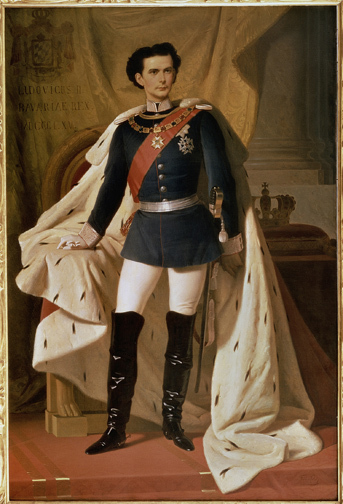 Ferdinand Piloty the Younger (1828–1895), King Ludwig II in Bavarian general’s uniform and coronation mantle, 1865. Reproduction. Schloss Herrenchiemsee. bpk, Berlin /Schloss Herrenchiemsee, Germany / Art Resource, NY. 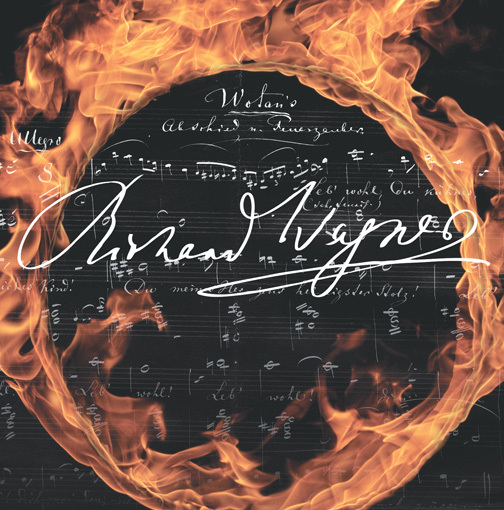 Richard Wagner (1813–1883), Das Rheingold, Mainz: Schott, 1873. 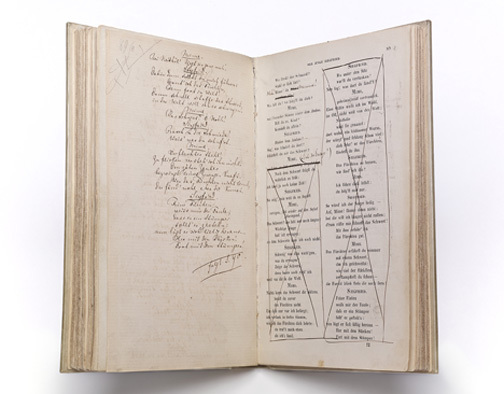 First edition, full score. James Fuld Music Collection, 2008. The Morgan Library & Museum. 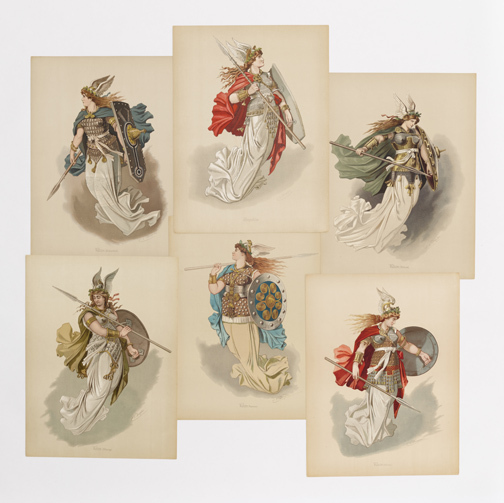 Carl Emil Doepler (1824–1905), A selection of costume designs, Der Ring des Nibelungen: Figurinen, Berlin: Berliner Kunstdruck- und Verlags-Anstalt, 1889, Chromolithograph. Gift of Hester Diamond, 2012. The Morgan Library & Museum. 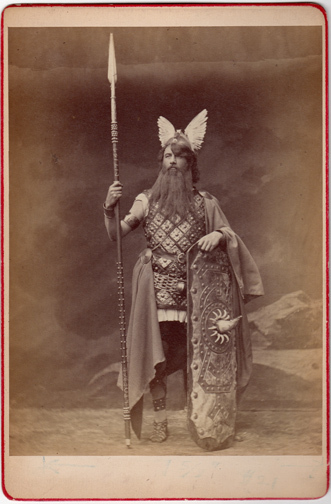 Franz Betz as Wotan in Die Walküre. Bayreuth production. Photograph by J. Albert, Munich, 1876. Metropolitan Opera Archives. 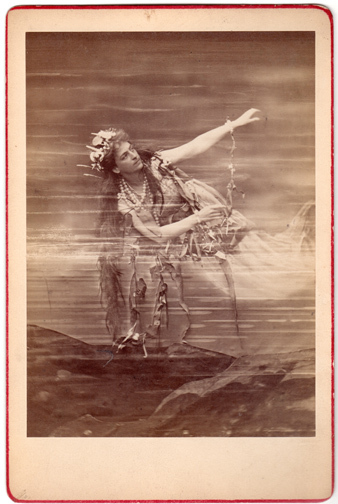 Lilli Lehmann as Woglinde in Das Rheingold. Bayreuth production. Photograph by J. Albert, Munich, 1876. Metropolitan Opera Archives. 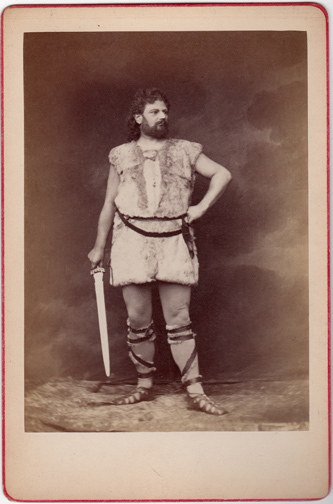 Georg Unger as Siegfried in Siegfried. Bayreuth production. Photograph by J. Albert, Munich, 1876. Metropolitan Opera Archives. 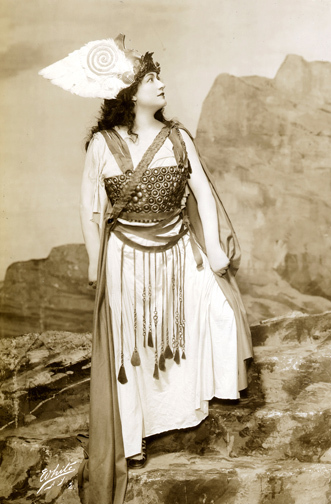 Amalie Materna (with Grane) as Brünnhilde in Bayreuth production. Photograph by J. Albert, Munich, 1876. Metropolitan Opera Archives. 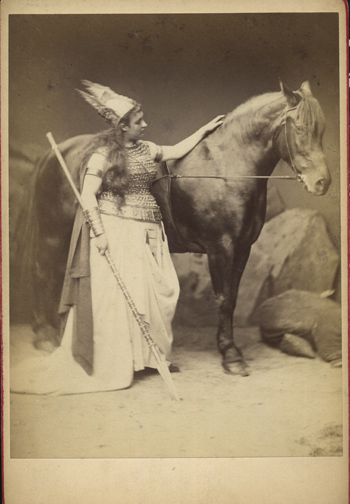 Olive Fremstad as Brünnhilde. New York Production. Photograph by White Studios, New York. Metropolitan Opera Archives. 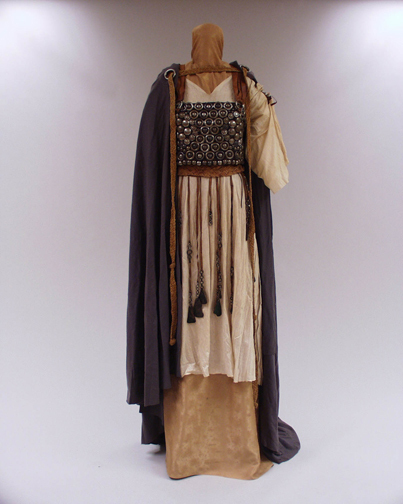 Brünnhilde costume for Die Walküre, February 9, 1911, worn by Olive Fremstad. Metropolitan Opera, New York. Metropolitan Opera Archives. 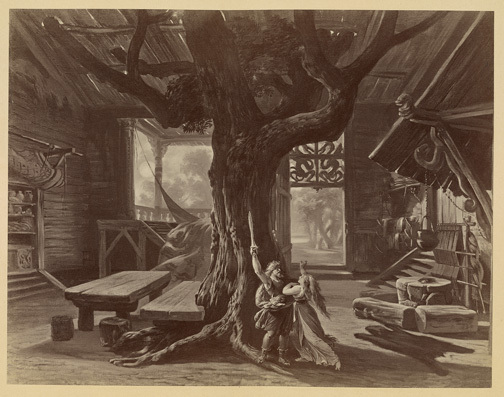 Joseph Hoffmann (1831–1904), Photograph of stage design for Das Rheingold, scene I. Vienna: V. Angerer, 1878?. Mary Flagler Cary Music Collection, 1968. The Morgan Library & Museum. 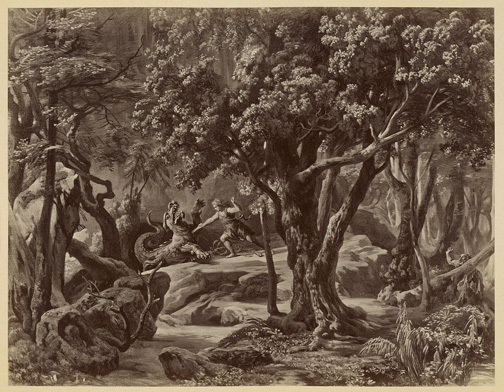 Joseph Hoffmann (1831–1904), Photograph of stage design for Die Walküre, act 1. Vienna: V. Angerer, 1878?. Mary Flagler Cary Music Collection, 1968. The Morgan Library & Museum. 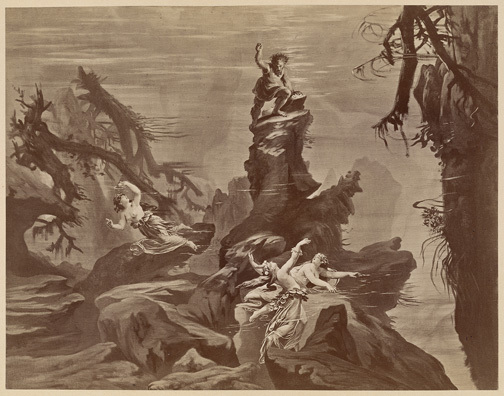 Joseph Hoffmann (1831–1904), Photograph of stage design for Siegfried, act 1. Vienna: V. Angerer, 1878?. Mary Flagler Cary Music Collection, 1968. The Morgan Library & Museum. 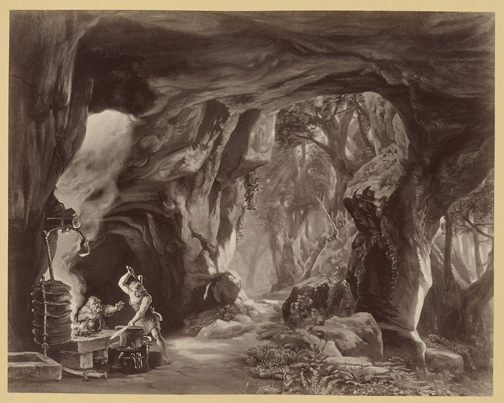 Joseph Hoffmann (1831–1904), Photograph of stage design for Siegfried, act 2 . Vienna: V. Angerer, 1878?. Mary Flagler Cary Music Collection, 1968. The Morgan Library & Museum. 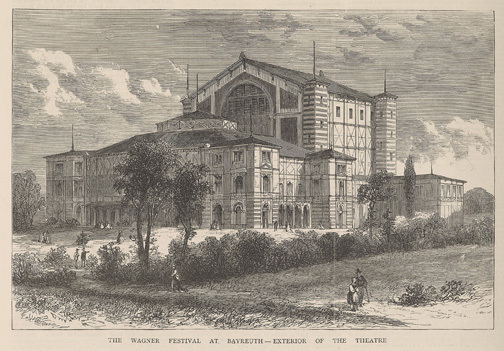 “The Wagner Festival at Bayreuth – Exterior of the Theatre,” The Graphic, August 12, 1876. Bequest of Gordon N. Ray, 1987. The Morgan Library & Museum. 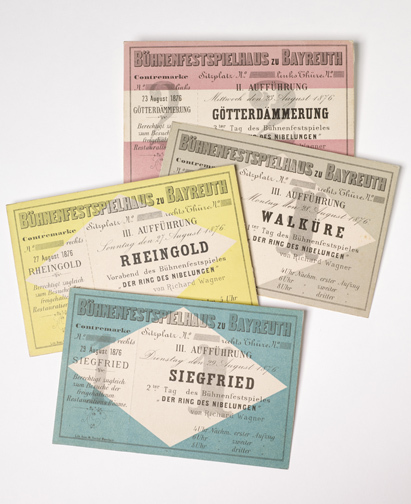 Tickets for the Ring cycle, Bayreuth, August, 1876. James Fuld Music Collection, 2008. The Morgan Library & Museum. 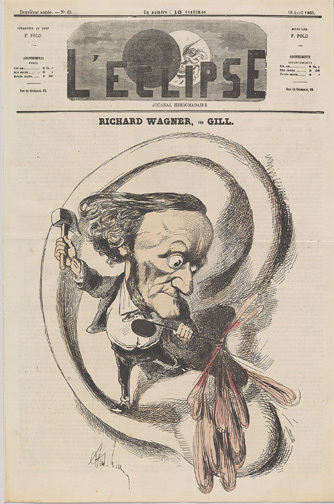 André Gill (1840–1885), “Richard Wagner” (caricature) in L’Éclipse, April 18, 1869. Gift of Hester Diamond, 2012. The Morgan Library & Museum. 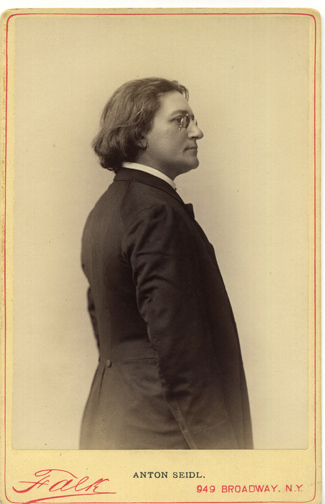 Anton Seidl (1850–1898), Photograph by Falk, New York. Metropolitan Opera Archives.